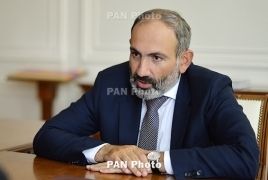 PanARMENIAN.Net - Armenian prime minister Nikol Pashinyan said on Tuesday, May 15 that snap parliamentary elections may be held in 2018. “We’ll discuss [the issue], I think [they will be held] this year,” Pashinyan told reporters, according to Aysor.am. Asked whether the National Assembly will approve the government program, Pashinyan gave a positive answer.